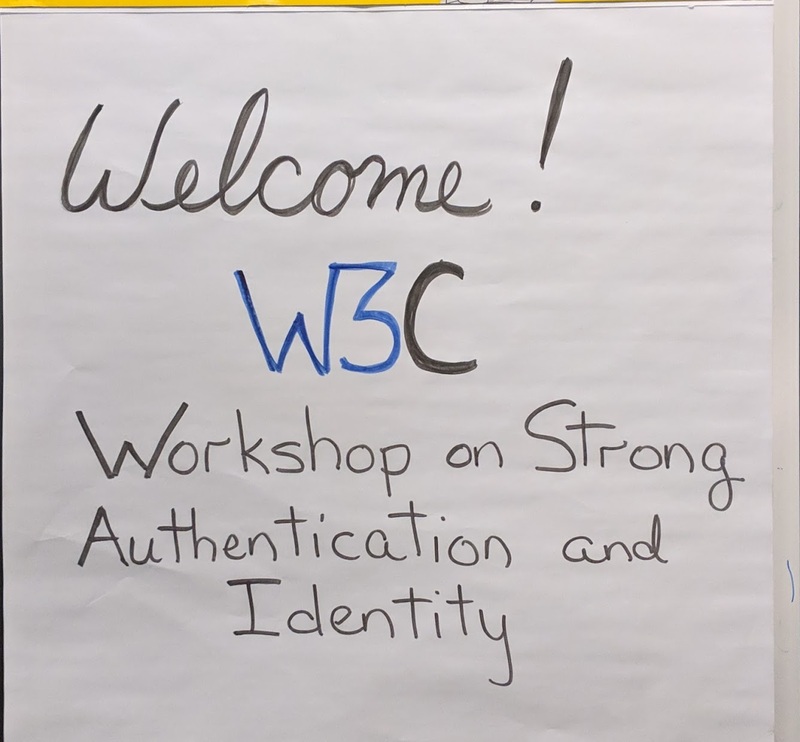 The W3C Strong Authentication and Identity Workshop gathered experts in the space to explore the existing standards landscape, examine existing technology roadmaps, and identify potential future work for how strong identity and strong authentication should work on the web. The workshop explored aligning recent W3C specifications (WebAuthn, Verifiable Claims, Web Payments) and work that is ongoing in the W3C Credentials Community Group (DID, DIDAuth) along with the IETF and ISO, as well as other existing community standards such as IndieAuth, Open ID Connect, OAuth, and SAML. A Verifiable Credential is an object a Holder can present to a Verifier showing assertions made by an Issuer. The Verifiable Credential contains one or more claims, metadata, an optional identifier, and a cryptographic proof that makes the digital document tamper-evident. W3C’s Verifiable Claims Working Group is preparing to recommend version 1.0 of the Verifiable Credentials Data Model in 2019. Decentralized Identifiers (DIDs) are a new type of identifier for verifiable, “self-sovereign” digital identity. DIDs are fully under the control of the DID subject, independent from any centralized registry, identity provider, or certificate authority. DID implementations, or “methods”, must specify create, read, update, and delete operations against a target ledger. DIDs “resolve” to DID Documents, which enable operations such as authentication, and DID management through its list of service endpoints and cryptographic key material. The W3C Credentials Community Group has incubated a draft community group report, Data Model and Syntaxes for Decentralized Identifiers (DIDs). As a next step, the W3C Credentials Community Group has proposed to form a W3C DID Working Group. In the Decentralized Identifiers (DIDs) community, the term “DID Auth” has been frequently used in various contexts, without a clear understanding whether it is meant as a high-level concept, or as a set of concrete protocols. If we consider what DIDs and their Decentralized Public Key Infrastructure (DPKI) inherently provide, it seems that “proving control of a DID” for authentication purposes is both very useful and relatively straightforward. In order to prove such control of a DID, the general approach is as follows: 1. A relying party sends a challenge to a DID controller, 2. The DID controller constructs a signed response and sends it to the relying party, 3. The relying party resolves the DID to its DID Document, 4. The relying party verifies the signed response using the public key discovered from the DID Document. Beyond this basic flow however, many different projects are currently implementing the high-level concept in different ways, using different data formats, transport mechanisms, and protocols. In order to introduce some clarity, a report was written by the Rebooting-the-Web-of-Trust community to describe the scope as well as different incarnations of the “DID Auth” concept. Given that “DID Auth” is at this point still a relatively new and unproven idea, there is now much discussion on how it relates to existing authentication technologies such as OIDC and WebAuthentication, which are mature and proven, and which have strong anti-correlation, anti-phishing, and key management properties. Continue to mature the DID and DID Resolution specifications, as a baseline for “DID Auth” and other DID-based protocols and applications. Continue to explore how to re-use existing, mature authentication frameworks such as OIDC and WebAuthentication, and how to combine the strengths of these protocols with new features provided by DIDs. Modern Authentication: “FIDO 2” is an umbrella term for CTAP and WebAuthn. CTAP (client-to authenticator protocol) is developed at FIDO; Web Authentication, an API by which the browser authenticates to a relying party (web application), is a W3C Recommendation. Together, the two enable strong passwordless authentication for the Web. EAT: Entity Attestation Tokens, under discussion at the IETF, provide device attestation about provenance. Such attestation can be used in WebAuthn and FIDO to require proof of authenticator strength. FIDO and Authenticators. FIDO Alliance oversees a certification program to validate the security characteristics of authenticator implementations, at Level 1 through 3+. JSON Web Token (JWT), representation of claims in JSON; can be signed with JWS. Used by OpenID Connect, among others. OpenID Connect is an identity layer on top of OAuth 2.0. IndieAuth: Bring your own identity, via URL. Prompt the user for identity, discover the authorization endpoint from the URL, send user there for permission, on the redirect back, exchange authorization code for access token and user’s canonical URL. Peter Watkins, Government of British Columbia, shared some identity needs and challenges. Multiple levels of jurisdiction, administration and contexts (individual and corporate, legal title, professional credentials, health, education, justice…). “Damned if we do, damned if we don’t” provide authentication/identity tokens, because there’s high value/infrequent usage of a government-specific identity; but there are privacy and accountability concerns with relying on third parties for government identification. Allen Brown described challenging situations for coalescing health and medical information with identity, including military field hospitals or civilian patients who seek only sporadic emergency care. Identity is needed by payers, providers, patients, and data. Jim Masloski shared the challenge of a supply chain ledger that requires transparency for some aspects, and confidentiality for others. Used DIDs to identify the brokers, suppliers, and customers, and Verifiable Credentials to describe products and provenance. A challenge was pulling information from legally mandated forms. Scott David shared “mild” and “wild” perspectives on legal practice relating to DIDs. John Fontana gave a history of 25 years in tech journalism, covering security, directories, messaging, identity, and the “wild ride from an LDAP directory to where we are now, and how much has been accomplished.” He remarked on the tremendous amount of work standards require, and commended the group, saying that collaboration through standards seemed closer now than ever. Takashi Minamii described the fragmentation and siloed identity systems used in Japan, where conglomerates build their own identity platforms and drivers’ licenses are the most common know-your-customer method. He identified a strong need for a loose identity federation. Shigeya Suzuki described structured identifiers, looking at GS1 standards including UPC bar codes. He suggested an opportunity for intersection between the work in GS1 and DIDs. From an Asia Pacific perspective, Pindar Wong invited the group to think about the next billion+, making self-administered identifiers serve netizen expatriates and displaced people whose right to work online is uncertain or unlawful as they have questionable legal standing or non-lawful status. Tom Jones and Mary Hodder spoke of the challenges of providing and using a “trusted identity,” one backed with verified claims upon which a recipient can rely. Mathias Brossard described attestation as a building-block for IoT security, starting from EAT and RAT. Christopher Allen built a picture of the decentralized identity stack, from Verifiable Credentials (VCs), Decentralized Identifiers (DIDs), DID-Auth, and further potential technologies for future work. He shared the Credentials Community Group’s roadmap diagram. Marie Lathière described European regulations requiring strong customer authentication, proposing that delegating authentication to merchants, with WebAuthn, can enable good security and user experience. Participants broke-out into discussion groups several times. Some of their outputs were reported in minutes. Other data were captured on index cards and “dot-voting” sheets. These materials are linked. There exist large legacy authentication systems that provide high assurance deployed and used by major governments and corporations. Two examples include the Common Access Card (CAC) and the Personal Identity Verification (PIV) card systems. There is work being performed to use this existing infrastructure to create “derived credentials” for use by newer authentication technologies such as that provided by the WebAuthentication specification, and potentially mechanisms provided via DID-Auth. A number of technology companies that participated in the workshop are involved with building solutions based on Decentralized Identifiers and Verifiable Credentials and integrating them with more traditional identity and credential issuing systems at large corporations and large governments. In many of these projects, W3C’s focus on global interoperability and combating vendor lock-in were identified as key reasons that government and industry funding is being directed toward building an interoperable ecosystem. Many of the proof of concepts focus on interoperability at the Decentralized Identifier, Credential Issuer, Credential Holder (digital wallet), and Credential Verifier roles. While much of the work to date has focused on data models, there is increasing interest in interoperable protocols that move the interoperable data formats from DID Ledger to Issuer to Holder to Verifier. There is a strong trend towards privacy-enhancing technologies that place primary control of identifiers, credentials, and authenticators into the hands of individuals. There was also an identified desire to move away from centralized control and storage for information related to identifiers, credentials, and authenticators. While this bodes well for addressing a variety of recent data breaches and questions around data sovereignty, the community seemed to agree that there was still a great deal of work that needed to be done to ensure privacy-enhancing technologies were used by default in the future. Many in attendance at the workshop noted that constant vigilance would be required by the W3C community, as well as the greater technical community, to ensure the current trend continues. The next Rebooting the Web of Trust (RWoT) is March 1-3 in Barcelona. All of these are expected to be active topics there, especially DIDs and the general direction of turning “DID Auth” into other existing protocols. WebAuthn API is a W3C Recommendation: https://www.w3.org/TR/webauthn/. The WG is preparing v2 work.